For sure, we all get bored with time by wearing the same old watch band on our Apple Watches. 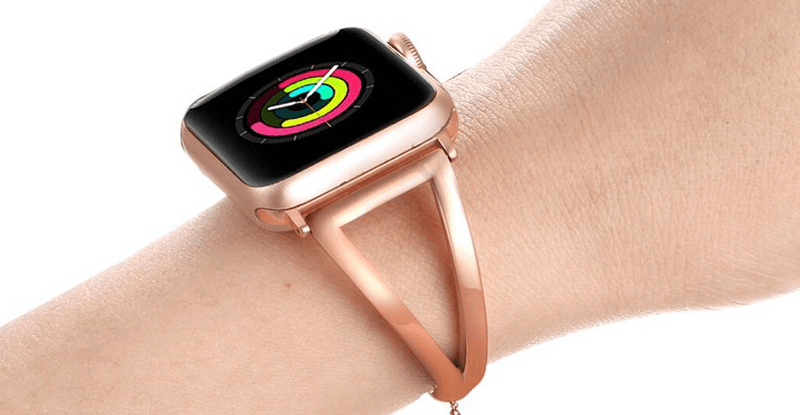 Well, if you are searching for some top-selling rose gold Apple Watch bands, then this article is for you! Rose gold is a hue to fall for, sprinkling glamour and sophistication on anything it touches. The best rose gold Apple watch bands sold today offer fashionable comfort and style to everyone who loves the color. All bands listed in this article are compatible with Apple Watch Series 3, Series 2 and Series 1. All Apple watch straps come with free express shipping and are available in 32mm and 42mm size. This iwatch band is made of top quality genuine leather by the brand named “COVERY”. If you are looking for a genuine leather band, then this would be the right choice for you. The chic, genuine leather band material is fully compatible with all 42 and 38mm versions of the iWatch and reinforced with durable stainless steel buckle set in a classy, single tour design. The band itself doesn’t press too much on your skin and is quite comfortable for all-day wearing. You won’t have to worry about odor and sweat, thanks to the leather’s anti-perspirant properties that wicks away bodily moisture. Those who purchased the band have rated it 5 star, and are happy with the product. As with all leather straps, make sure your band doesn’t get wet or submerged for prolonged periods of time to maintain its original form. Elegantly crafted and nice to look at, it’s guaranteed to make a stunning first impression wherever you go. If you are looking for an Apple Watch band that is fancy but not too fancy, well this could be the one for you. This band is made of Steel and comes with a tool that will help you adjust the band to whatever wrist size you want. This watch strap series 1, 2, or 3-compatible is designed by “Lwsengme”, a well-known brand for designing and making watch bands for many other smartwatches. You get an unbeatable combination of style and comfort, thanks to the easy adjustment tool for sizing down. The material is made from premium 316 stainless steel and a folding clasp that makes it easy for wearers to take the band off or put it on as needed. You can also get a free collocation on sizes and colors for a customized look. The elegant style of the band is simply perfect for huge occasions. Rose gold bands match seamlessly with any evening dress and other formal attires. Sparkling rhinestones complement the intricate craftsmanship, exuding total femininity. In fact, you could become so attached to it that the steel wrist band becomes your new favorite! 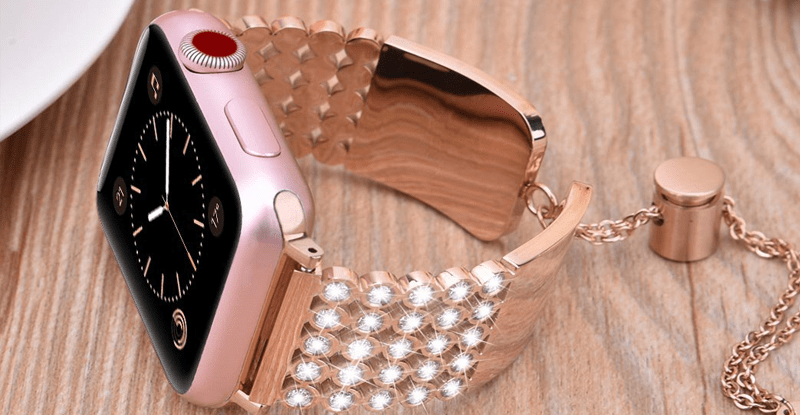 If you’re looking for an Apple Watch band that’s solid and comes with a fair amount of bling, then this Rhinestone-studded band is for you. This super stylish rose gold Rhinestone Bling Band is designed and built by “Secbolt”. High-quality stainless steel covers your wrist in an elegant fashion. Unlike other jewelry bands, there’s no worry of damaging Secbolt’s band product because it’s built to survive scratches and bumps. Made of durable stainless steel, your Rhinestone Bling Band from Secbolt won’t get easily damaged. Resizing the band is a matter of simply removing the clasp and adjusting the band according to your wrist. Rhinestones catch the light and add to the feminine charm of this bling band resembling high-end jewelry. This fashionable band strap will surely get you compliments from others! One of the better-looking Apple Watch bands out there that offers unmatched quality, comfort and prize. 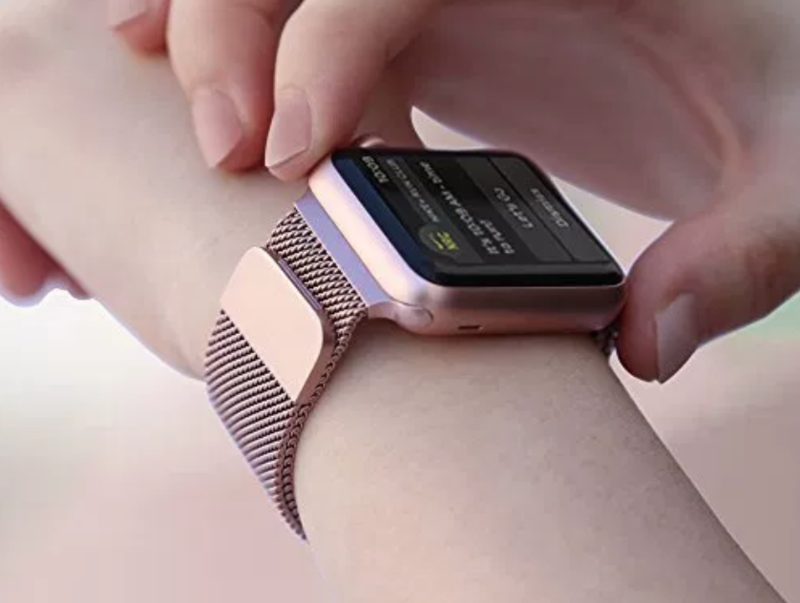 The woven steel design of the rose gold milanese apple watch band makes it an excellent choice for everyday use. The manufacturer, BRG has made it a point to make their product more accessible by putting an affordable price tag on the Milanese Loop Band. Wearing and removing the Apple Watch band is a cinch due to the one-button mechanism. Its h3 magnets hold the band so tight. There’s no buckle required, no addition sag and no need to get rid of the links. This Milanese Loop is one of the amazing bands BRG sells and closely mimics Apple Watch bands. With a magnetic clasp and woven-steel construction, it is simpler to accurately adjust to more wrist sizes compared to most other brands. 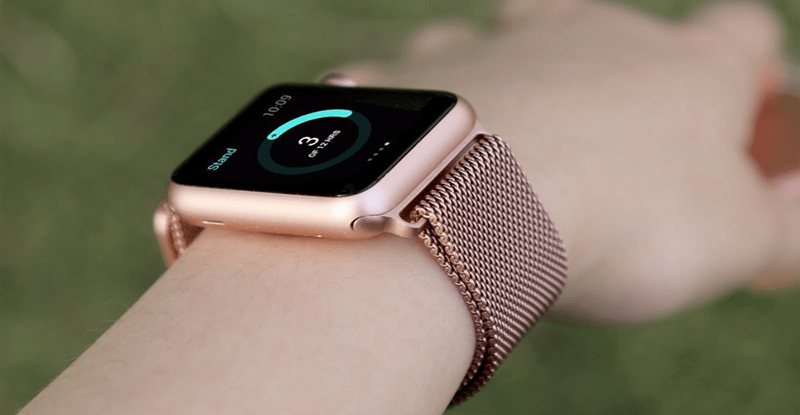 This inexpensive rose gold woven-steel Apple watch band offers versatility at much affordable cost. This also marks the a perfect sports band. Fashionistas, take note- you can now mix and match different-colored bands of the same brand or any other band you have in less than a minute! Plus, the 18 months warranty provided by BRG is the icing on top! Looking for the newest cowboy style design replacement band? Look no further. 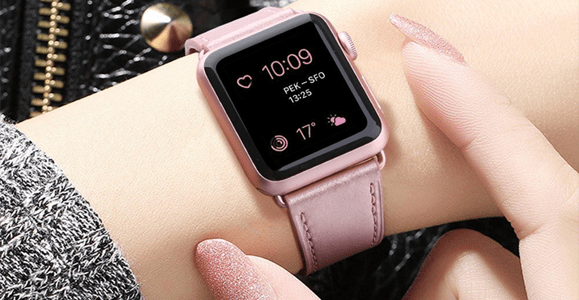 AOKAY’s latest band offering ticks all the checkboxes you’d want from a stylish rose gold apple watch band series 2 and series 1 42mm versions. This is made of top-notch stainless steel, luxury and elegant material, comfortable for everyday use. It features precise cut-out, visits all holes and buttons. This rose gold cowboy chain band for the Apple watch is one of the perfect gifts for yourself, friends and family who own an Apple Watch series 1 or 2. Delicate links appear dainty and perfect for any wrist size. The links themselves aren’t just for show- wearers can easily adjust the band for a looser or snug fit via a hand removal mechanism. AOKAY’s rose gold stainless steel metal cowboy chain band makes it convenient and simple to adjust the length with the Apple Watch. No tool required to adjust this band which fits 1.38mm 160 to 200mm wrists. 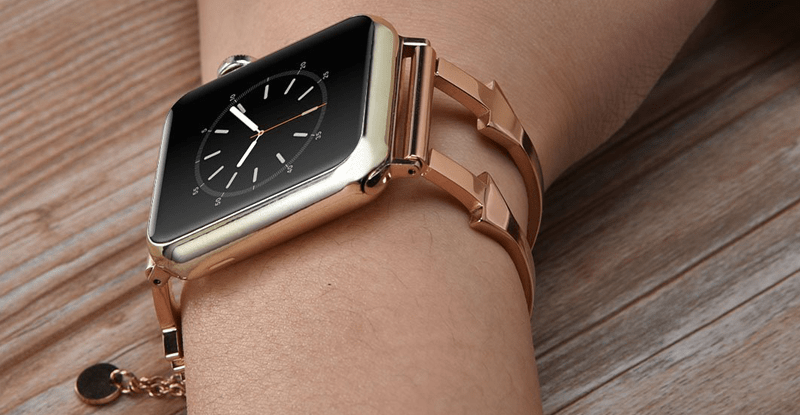 The stainless steel material is electroplated to match your Apple Watches’ color at an astounding 99% accuracy. You won’t find any other design that looks good no matter the occasion, whether you need a durable day-to-day strap or need a highlight accessory for your evening or party wear. Classic, yet undeniably stylish in its own right. These are the words that will run in your mind when you set your eyes upon the high-quality band made by ImmSss. Everything about the band screams traditional, from the semi-circle blade configuration, the smooth curve of the links to the unique mechanism that secures the band firmly yet comfortably on your wrist! When you need a no-nonsense band that can complement a variety of styles, then this is for you. It’s a practical choice for your Apple Watch. It also makes a one-of-a-kind gift for family or friends. ImmSss’s is made of a high-quality rose gold stainless steel material that allows you to install the band and remove it without any issues. It comes with a band adjustment tool and a classic dual folding clasp. When it comes to design, it is classy and perhaps you might have seen such designs in most steel watches before. This band will surely compliment your style and available for both the models of Apple Watch (38mm and 42mm). Dainty, sophisticated gold arrow designs are rare, and there’s nothing more exquisite and precious than V-Moro’s band design. Be prepared to field a dozen questions from admiring onlookers and conversations about your Apple Watch band, because this is exactly what will happen when you wear this head-turner! The stainless steel rose gold hue matches with your Apple Watches’ color seamlessly. The band’s unique button clasp features a fine chain and easy adjustment for total comfort. The absence of screws and heavy spring bars make the band 32mm or 42mm sizing option light and surprisingly sturdy! The intricate and sophisticated rose gold arrow stainless steel on V-Moro’s wristband makes it look classy. It fits 5.5 inches to 8.6 inches wrist and design of this wristband is quite remarkable. Its design isn’t much complicated as well. It features a unique buttons clasp, which adds to the sophisticated appearance of the band. However, the 38mm women Apple Watch band customers might need to wait for some time as it’s accessible just for 42mm watch model. 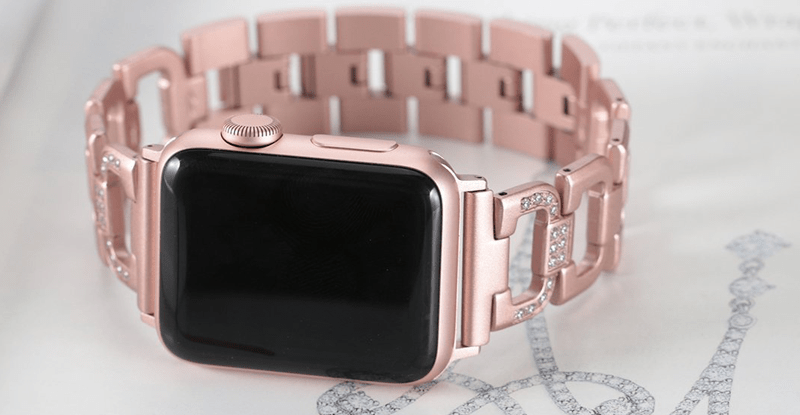 For those who want to give their Apple Watch a lavish look, then the V-Moro’s luxury diamond rose gold stainless steel Apple Watch band is the ideal option for you. The Ultimate Cuff is simply laden with clear Swarovski jewels that capture the light and sparkle on any angle. The band is compatible with any Apple Watch series 1, 2 3, and 2015 and 2016 models. The free band mechanism makes adjusting a snap your band 42mm or 32mm model. You also get the trademark button clasp that the brand is known for. This fits 5.5 inches to 8.6 inches of wrist size and it’s so easy to adjust the length of the band without the help of a needing tool. It also comes with an Apple Watch adapter, which is likewise made of stainless steel and foregoes the need for screws. Sparking, clear Swarovski crystals bring about undeniable luxury when you attach the band onto your favorite Apple Watch. This stylish steel band makes a great gift for any classy women out there. You’d better be prepared, because V-Moro’s decadent offering will surely get you envious glances thrown your way! Vintage never goes out of style. To prove it, Fastgo’s offering a classic band that can match your preferred fashion of the day, whether it be casual, business and everything in between. The thin stainless steel work highlights the watch and ends in a Tassel locking mechanism for a customized, snug fit. You can wear this over any outfit and attend birthdays, parties, concerts and business meetings without worries. Moreover, the adjustable feature make it a one-size-fits-all band series 2,1, third version, sports & edition-compatible product. The band material is made from 304 stainless steel, textured for a truly unique appearance! Showcasing fashionable design, Fastgo’s Vintage Classy Stainless Steel Band easily catches your attention. 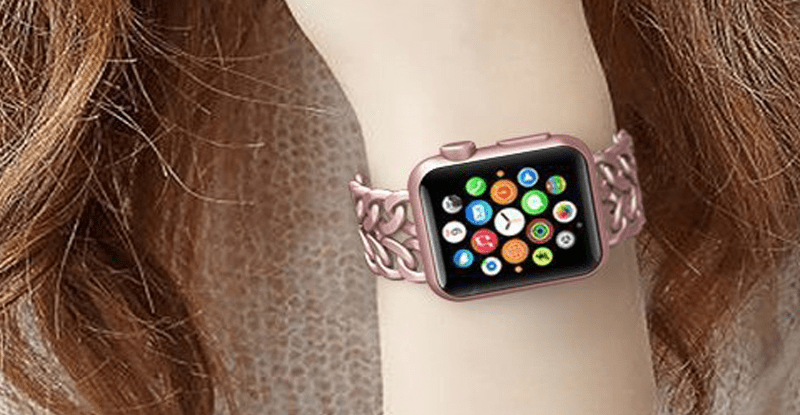 The main highlight of this rose gold steel band for the Apple Watch is the stainless steel beaded design. Addition of pendants has brought more charm to it. For those chic women who love to attend parties and formal events, this band is ideal for you! The band is adjustable for the Apple watch and it’s one size that fits all, as the size can be adjusted with its pendant locking position on the Tassel. Wearlizer bands are beautifully designed and makes a perfect match with the Apple Watch. What has upraised its style quotient is the addition of rhombus design. 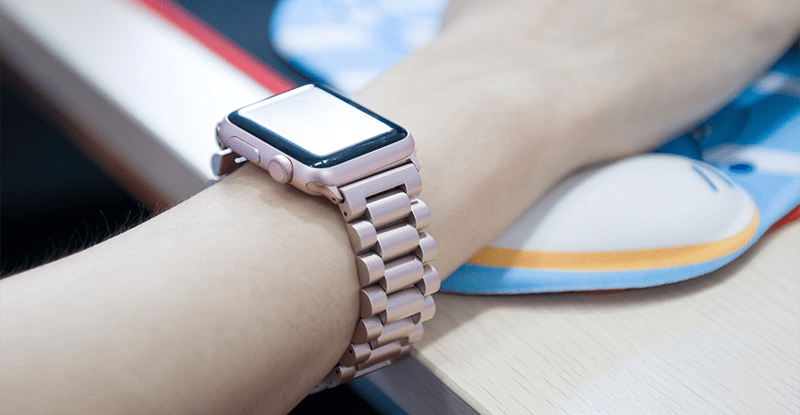 Wearlizer carves out their own niche design with the rhombus shape, and the result is an extremely appealing band for your Apple Watch. Geometrically shaped, the premium stainless steel band is fully compatible with Apple Watch series 1, 2, Nike+, Edition and Sport type. Comes in with a band removal tool for that snug, personalized fit. Created with a top-notch rose gold stainless steel material, this band is a durable companion of the watch. The clasp is prepared to lock the watch effortlessly. 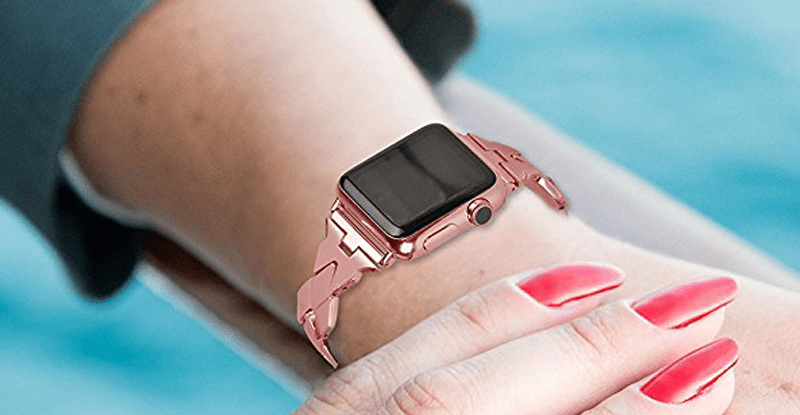 Beyond features, this band from Wearlizer will surely befit a partner for your Apple Watch. 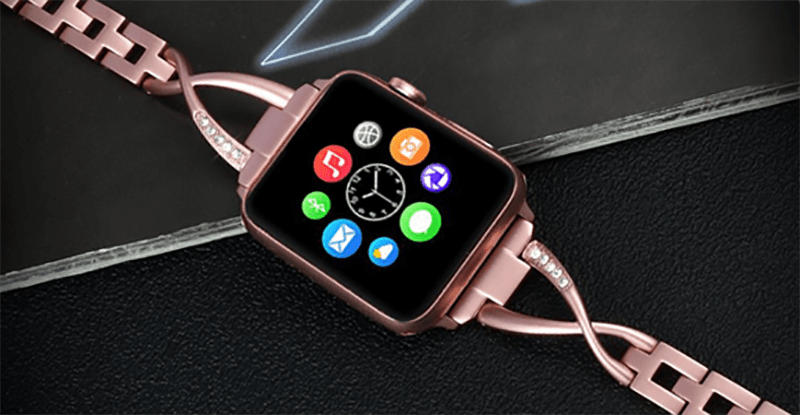 Wow anyone who lays their eyes on your iWatch with the stunning design from Wearlizer!